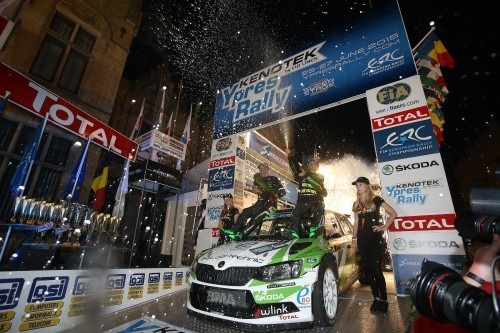 Freddy Loix came from almost 30 seconds behind to score a sensation 10th win on the Kenotek by CID LINES Ypres Rally, and in doing so gave the brand new ŠKODA Fabia R5 victory on its FIA European Rally Championship debut. Co-driven by Johan Gitsels, Loix had to adapt his driving style to make up for a lack of mechanical grip with his new BMA-run car, which struggled to find the required grip coming out of the many tight T-junctions. Having been tipped as pre-event hot favourite, Loix was fifth overnight, 25.8 seconds behind the leader after seven stages. His first of five stage wins was only registered on SS9. But Loix gradually closed the gap on the cars ahead, and victory was assured when Craig Breen retired after SS12, Stéphane Lefebvre picked up a puncture on the same stage and leader Bryan Bouffier was forced to stop to change a puncture on SS15. Loix also scored maximum ERC Asphalt Masters points. Bouffier had driven brilliantly in his Citroën DS3 R5, and despite the attacked by Loix held the lead by 1.4 seconds entering SS15. Such had been his pace, that even though he lost two minutes with his mid-stage tyre change, he still finished second, 1m 27.5s behind. Vincent Verschueren put previous Ypres Rally bad luck behind him to finish third on his home round of the ERC. He had a nervous run to the finish, as his Citroën DS3 R5 had lost first gear – although he didn’t reveal that until the end of the final stage, as he didn’t want his rivals to know. Craig Breen had been leading the event by 12.6s in his Peugeot Rally Academy 208 T16, until he picked up a puncture and lost 15s and the lead to Bouffier on SS11. Worse was to happen on the following stage, when he slipped off the road on a left-hand corner and into a field. Having lost over 30 seconds, he arrived at the end of the stage with his car’s radiator full of vegetation and the water temperature reading 155°C. Unfortunately, the car then refused to start, and he was forced to retire. Despite this, Breen’s three wins sees him maintain his ERC lead. On his first Tarmac rally for eight months, Bruno Magalhães drove brilliantly in his Peugeot 208 T16. The Portuguese driver acted as dust sweeper by running first on the road during leg two, but never put a foot wrong on his way to a fine fourth. After a brilliant first Ypres Rally in a four-wheel drive car, Stéphane Lefebvre was in third position in his Peugeot 208 T16, just 1.3s off the lead, when he picked up a front right puncture six kilometres into Hollebeke, which, at 23.23 kilometres, was the longest test of the event. The Frenchman lost over three minutes and with it all hope of victory, yet he still managed to finish fifth – just ahead of Jaroslav Orsák, who survived intercom problems in his ŠKODA Fabia S2000. Josh Moffett battled with an early misfire and brake problems in his Fiesta RRC, and was about to finish seventh when he crashed out on the final stage. His brother Sam was going well, although he retired on a road section out of service today, when an electrical problem cause his water pump to fail and, with the water temperature rising, he had to park his identical Ford to avoid damaging the engine. Jaromír Tarabus lost a minute with a rear left puncture on SS11, after he clipped a bank in his ŠKODA Fabia S2000, although an otherwise good run saw the Czech driver finish seventh. Didier Duquesne, who put his Fiesta R5 into a ditch for one minute on SS9 and then survived a huge spin on SS11, initially came home eighth, but was later excluded after a discrepancy at a time control (TC 17C). This allowed a typically hard-charging Marty McCormack to move up to eighth, after an eventful rally which saw his Fabia S2000 in various fields and ditches from time to time! Had Davy Vanneste not lost over two minutes when a turbo pipe came off his Fiesta R5 on SS2, he feels he would have beaten his sixth placed finish of last year, yet he was pleased with ninth. Euan Thorburn’s first visit to Ypres had its fair share of overshoots, as the fast and often unsighted junctions caught the Scottish champion out. Only a last minute transmission problem denied him a top 10 finish, as his Fiesta S2000 came home 11th, behind the Fabia S2000 of Petter Kristiansen. Bernd Casier was the top Fiesta R5 runner and had moved from sixth to fifth when he retired on SS12. Kris Princen, who was fourth overall overnight in his Peugeot 208 T16, was forced to withdraw from the event on doctor’s orders, and did not start leg two. Tibor Érdi led from start to finish to claim ERC2 victory in his Mitsubishi Lancer Evolution X by 3m 35.6s. Co-driven by double Hungarian rally champion Gergely Patko, Érdi used his experience of the West Flanders roads to take an early lead, and held onto it with 12 fastest stage times, despite Vojtěch Štajf getting fastest and fastest as his first appearance on the Ypres Rally progressed. Once Štajf got used to the stages, and had changed his driving style to stop his Subaru Duck Czech National Team Impreza WRX STI sliding so much in the tight corners, he set five fastest times, although stopping to replace a front left puncture on SS15 finally confirmed him in the runners-up position. Second place was enough for Štajf to extend his ERC2 lead, which was important as the Czech driver will skip the next round in Estonia. 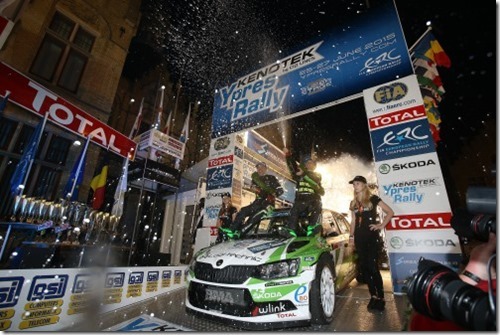 Aleks Zawada jumped from third in ERC Juniors to score his maiden class victory, after a dramatic final stage in Ypres. The young Polish driver led for the opening four stages in his Adam R2, but spun, twice, on the opening stage of day two and got stuck in a ditch, losing one minute. A magnificent drive saw him fight back from sixth to third, before both drivers ahead of him hit problems within sight of the finish. Marijan Griebel looked on course to win in his ADAC Opel Rallye Junior Adam, but a puncture on the last stage cost him two minutes. This would have seen Diogo Gago take victory for the Peugeot Rally Academy, but after a textbook performance his 208 stopped on the final stage – meaning Griebel only dropped to second. Julius Tannert fought hard for his third place finish, fighting back from early set-up issues with his Adam R2 to show his class on fast asphalt. Likewise, Gino Bux got faster and faster as his confidence returned, finishing strongly in fifth in his Peugeot Belgium Luxembourg 208. Ralfs Sirmacis put his 208 off the road on SS13 and spectators with a rope came to his rescue. He finished sixth, while his Sport Racing Technologies team-mate Vasily Gryazin wasn’t so lucky – crashing out on SS14 and blocking the road for Tannert and Amaury Molle. The young Belgian driver drove sensible when his Fiesta R2’s brakes disappeared, to clinch the final ERC Junior finishing position. Title rivals Emil Bergkvist and Chris Ingram both failed to finish. Bergkvist retired 9kms into SS12 with an engine related problem – his Adam R2 had an oil leak, but only a detailed examination will determine if that was the cause or the result of the engine shutting down. It was also an engine related issue that put Ingram out, as he lost all drive on his Peugeot UK-supported 208 leaving the start line of SS10. He had just set his second fastest time of the event, and was on a charge. Florin Tincescu retired his 208 with gearbox problems and Joachim Wageman parked his 208 in a deep ditch on SS8. Polle Geusens lost five minutes with gearbox problems, and a snapped gear stick, in his Fiesta R2 on day one, but his perseverance was rewarded when he finished the top non-ERC Junior in the ERC3 category. Szabolcs Várkonyi finished 30.9s behind in his Peugeot 208. Defending ERC Ladies’ Trophy champion Ekaterina Stratieva broke an engine mount on her Citroën C2 R2’s on SS3. She had hoped to return under Rally 2 rules, but the team found the engine had also suffered a broken piston and valve, which made a return on day two impossible. Sławomir Ogryzek vows to return to the ERC as soon as possible, after his 208 was destroyed by fire. Le Mans 24 Hour pole-sitter Romain Dumas looked set to clinch the FIA R-GT Cup, and finish fourth overall, until his Porsche 911 GT3 suffered transmission problems on the penultimate stage. This gave Patrick Snijers a surprise win – surprising, because the restrictor modifications arrived very late and he didn’t get to drive his Porsche 997 GTS in the new spec until the opening day of the event. François Delecour survived a few overshoots and spins in his 911, but his hopes of victory disappeared when he lost over eight minutes with an off on SS12. He still managed to secure second, 1m23.8s behind Snijers. There was no hiding how much Marc Duez was enjoying driving his 911 on the fast Ypres roads, and third was fine reward for a textbook performance. ERC wins in 2015: Breen 3, Kajetanowicz 1, Loix 1. ERC stage wins in 2015: Breen 26, Kajetanowicz 24, Lukyanuk 9, Loix 5, Lefebvre 4, Bouffier 4, Barrable 4, Abbring 3, J Moffett 1, Moura 1. 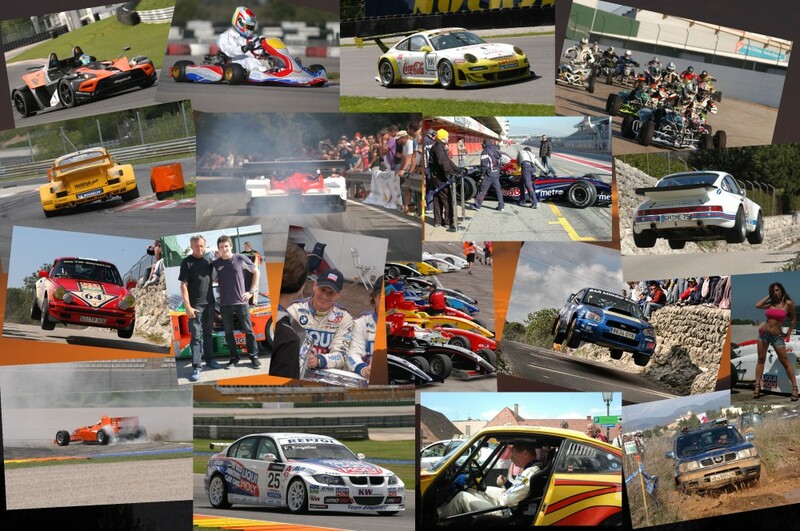 Go to Fiaerc.com for the championship positions following round four of 10. Dieser Eintrag wurde veröffentlicht in FIA ERC Rallye von Wolfgang. Permanenter Link des Eintrags.